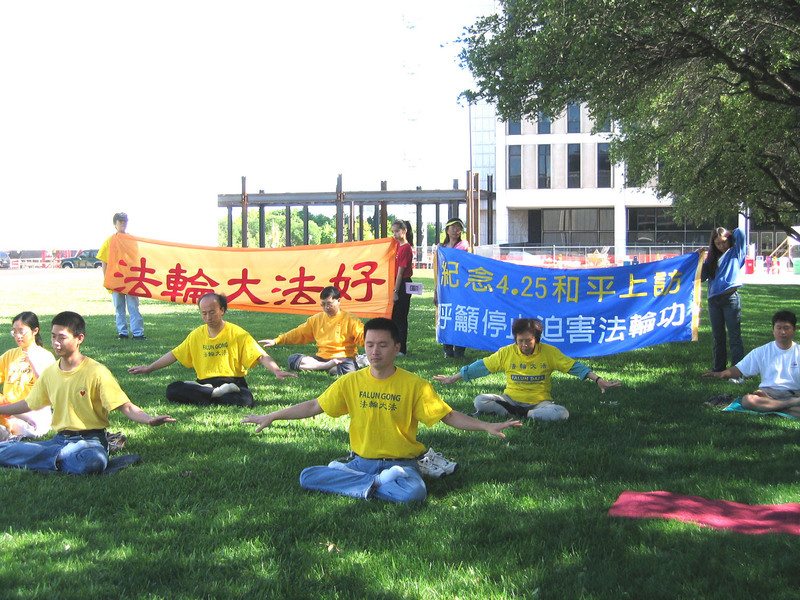 (Clearwisdom.net) (By Reporter Zeng Hong) On April 25, 2004, Falun Gong practitioners in Dallas did group exercises and offered free instruction in the Falun Gong exercises on Kennedy Square in downtown Dallas. Their gathering was to commemorate the fifth anniversary of the peaceful April 25 appeal in Beijing and to call for the end of persecution of Falun Gong in China. On April 25, 1999, ten thousand Falun Gong practitioners went to appeal at the State Department Appeal Office in Beijing regarding the illegal arrest of practitioners in Tianjin. Prime Minister Zhu Rongji met with a few practitioners and reached an agreement with them, including the release of the detained practitioners by the Tianjin Police Department, freedom to practice Falun Gong and to publish the book "Zhuan Falun." The issue appeared to be well resolved. Chinese and overseas media widely reported this event and put Falun Gong, the low-profile self-cultivation group, onto international stage. The practitioners didn't chant any slogans, display any banners, carry on loudly or block traffic, their peaceful settlement of the appeal was envied by Jiang, then head of the Party. He utilized propaganda to spread lies and launched the brutal persecution of innocent Falun Gong practitioners with abductions, torture, forced labor, prison, brainwashing and mental hospitals. It has been five years since the April 25 appeal. Those with ulterior motives use the peaceful appeal as justification for the persecution. Falun Gong practitioners Ms. Sun and Ms. Fu were at the April 25 appeal in person. They told the author what they had experienced. Ms. Fu: I didn't know anything until the evening of April 24. A fellow practitioner at our practice site called my home. My parents answered the phone. They told me about the arrests in Tianjin. Falun Gong practitioners in Tianjin weren't allowed to do the exercises outdoors. Some of them had been arrested. Some practitioners had planned to go to appeal for them. My parents decided to go and asked me if I wanted to go. I said, "Of course!" My mother had gone to appeal at a Beijing TV Station before. I remember she was very happy and excited when she came back from it. She told me that officials of the TV station met with them. Many practitioners told their personal stories about how their health and family lives had benefited form Falun Gong. The officials of the TV station had been moved and realized that their TV program two days before failed to report the true image of Falun Gong. They decided to make another program to correct their mistakes. It was an intern reporter who had made a mistake. They even thought about firing him. But Falun Gong practitioners asked the officials not to give him a hard time. He probably had not learned these facts about Falun Gong. Practitioners said the reason why they went to the TV station was not to blame anyone, but to tell the facts. Ms. Sun: I am seventy. I had practiced Falun Gong for four years before April 25, 1999. I have personally benefited a lot from Falun Gong. I used to have many diseases. All medicine and treatment couldn't cure my diseases. I had given up. One of my colleagues told me about Falun Gong. After I started practicing it, I began to walk by myself and to go downstairs by myself. Eventually I was able to go to group exercise. All my diseases were gone. Around six on the morning of April 25, I went to our group exercise as usual. My fellow practitioners, a retired professor of Beijing Teachers Normal University and a senior engineer told me what had happened in Tianjin. I decided to go to appeal with them. Ms. Fu: Just like our appeal at the Beijing TV Station, the "4.25" appeal was to tell state officials facts about Falun Gong so that distorted reports could be corrected. I have no interest in politics. I have never thought of any political purpose when I went to appeal. I felt I should go, because Falun Gong is great. It was so simple. Ms. Sun: There were reasons behind it. From 1996 to 1998, distorted reports kept appearing on newspaper like "Guangming Daily," "Jinan Evening Newspaper" and Beijing TV. Practitioners doing group exercises at east gate of Tiantan Park had been harassed. These reports aimed to harm Falun Gong by shifting blame and fabricating rumor. Because every one of us had benefited from Falun Gong and following Truth-Compassion-Forbearance, we all wanted to clarify it to government leaders. We deserve a safe environment for our cultivation practice. It was the only thing in our mind. We had retired. We had got poor health after a rough path of life. The only thing we asked for was the freedom to enjoy doing our exercises. Who would have any pursuit in politics? Falun Gong cultivation practice is complete voluntary. Anyone can come and go anytime. Some volunteered to teach the exercises. We had no organization, no political pursuit and no intention to be against government. Ms. Sun: Around 6am on April 25, I and two fellow practitioners went to the Appeal Office by bus. Every bus was full. Some people brought food with themselves (bags of baked pancakes) and got on bus in lines. The packed bus was very quiet. We got off the bus at Fuyou Street and walked to the west gate of Zhongnanhai. A security guard asked us why we were there. I told him I practiced Falun Gong. He asked us to stand across the street. We followed his instruction. Words came that representatives might get in. By that time, a lot of people had gathered there. A few people went in the gate. We waited outside. Around 11am, we heard claps from far away and heard people say that Prime Minister Zhu has met with some practitioners. While we were waiting, everyone was very quiet. There were elderly people and students. We didn't know each other. Police cars left because we were very peaceful. The policemen who stayed either smoked or had drinks. Ms. Fu: The issue was solved very well on April 25. We happily went back home in the evening. We found out later that we were accused for besieging and attacking Zhongnanhai. I don't know why "besieging and attacking" were used in the news report. I don't understand how we ever "attacked" Zhongnanhai. As for "besieging," we stood at the place the security guard showed us. If we were standing around Zhongnanhai, it was because they put us around the compound. As for "attacking," anyone would think it is a problematic word to use. We didn't have any tank, cannon or even brick. We didn't have any slogan. We even whispered to keep quiet. What did we use to attack? How did we attack? Some people intentionally labeled us a group against government in order to incite hatred of those who don't know the facts. They had their purpose for doing it. When the crackdown was announced on July 20, it was totally unexpected for us. Mr. Shao, a gentleman in his seventies said, "We gather here today to commemorate the peaceful April 25 appeal, a magnificent feat of Falun Gong practitioners and call for the end of persecution of innocent people who practice Truth-Compassion-Forbearance.